When designing a home office it's important to get the lighting right and a purpose-designed home office desk lamp is a must-have. But choosing the best home office lamp isn't just about finding a piece that's practical. The very best home office lights are good looking, too. Whatever your style; we’ve put together a buying guide of our favourite desk lamps that’ll make your home office work for you... and look fantastic too. The original and best, the Anglepoise Type 75 table lamp takes 80 years of innovation and packs it into the perfect light for offices. With its endlessly adjustable stalk and focused light, it manages to look both classic and modern, as well as allowing you to focus in on the finer details of the task at hand. Helpful and handsome, this iconic design earns our top spot for superior design and perfect performance. This minimal and functional table lamp is the ultimate space saver. It comes in especially handy if you don’t have a permanent home office or use the dining room table as your desk, as it folds down into a neat, flat rectangle that can be stored in a drawer, and charges by USB for portability. It also has the option of hooking onto the wall to illuminate anywhere. For those who tend to find themselves working at the kitchen table and like the idea of having a foldable desk lamp you can pack away with your paperwork, yes they do exist! This classic Emeralite banker’s lamp will be very much at home in any traditional office space, and looks especially grand on a dark-wood desk. While it doesn’t have the traditional pull chain you might expect, the lamp is in keeping with the classic design we’ve all seen on screen, with a durable metal base and instantly recognisable emerald shade. If you’re after that timeless library look, this is one of the best classic looking lamps out there. If rising and working in the dark has you feeling down in the dumps, the Lumie Desklamp can help. Engineered for sufferers of Seasonal Affective Disorder, it mimics natural sunlight to boost your mood when real light is scarce, and can even improve your concentration and energy levels, perfect for freelancers and anyone else who works from home year-round. It doesn’t look the smartest but it’s a very useful little gadget to keep handy in any home workspace, with touch-adjustable brightness and an adjustable stem. For sheer mood-improving qualities alone, this SAD lamp has earned its place in our top list. This stunning lamp has a touch of the Art Deco about it, looking just as at home as a statement-maker in a light, airy modern office as in a richly decorated study. Its all-over mirror-finish copper (also available in chrome) adds a dose of warm colour and interesting texture to a room. 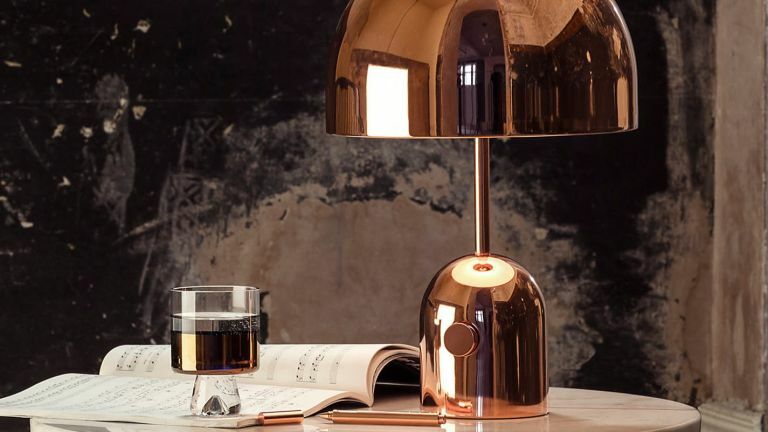 Tapping into the current rose gold trends, this designer copper desk lamp is a feature as much as it is a functional light. For the modern looks of the Anglepoise desk lamp at almost half the price, look no further than this sleek lamp from John Lewis. Whether you choose the almost imperceptibly pale pink to suit a bright and airy or glamorously girly office, or the satin-finish black, you’re assured of a cool minimal look thanks to the industrial concrete base, curved shade and brushed brass hardware. This lamp doesn't quite have the sturdy feel of a true Anglepoise design but, it has got a modern and high quality finish.